FORT HOOD, Tx. -- Nine soldiers were killed and three injured after an Army troop carrier was washed from a low-water crossing and overturned Thursday in a rain-swollen creek at Fort Hood. Officials say the accident happened as flood waters started to come up. The base says the road was in the process of being closed. It was a remote area near Owl Creek designated a low crossing area. The soldiers were learning how to operate the army vehicle when the accident occurred. All soldiers present at the time of the accident have been accounted for. The names of the three rescued may be released later Friday, according to a base official. They have all been released from the hospital. Army teams and other emergency crews searched along a Fort Hood creek overnight. 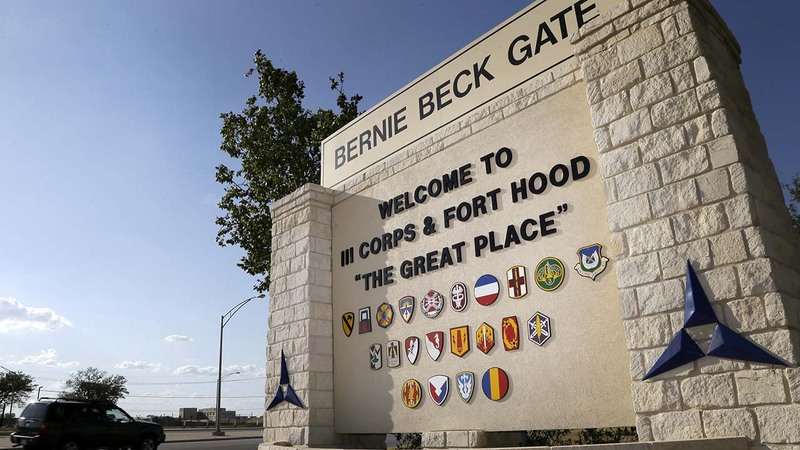 Fort Hood spokesman Chris Haug said the search continued after teams found the bodies of two soldiers who had been in the vehicle. Three others were found dead shortly after the 2-ton truck overturned. Aerial and ground crews searched the 20-mile creek that winds through heavily wooded terrain on the northern fringe of the base. Army aircraft, canine search teams, swift-water rescue watercraft and heavy trucks were being used. The Army did not release the names of the dead because it was still notifying relatives. Parts of Texas have been inundated with rain in the last week, and more than half of the state is under flood watches or warnings, including the counties near Fort Hood. At least six people died in floods last week in Central and Southeast Texas. Fort Hood spokesman John Miller said the crossing was flooded by two days of intermittent heavy rains when the swift water swept the truck, called a Light Medium Tactical Vehicle, from the road. The vehicle resembles a flatbed truck with a walled bed and is used to carry troops. Texas Gov. Greg Abbott issued a statement saying the state "stands ready to provide any assistance to Fort Hood as they deal with this tragedy." The base has seen fatal training accidents before. In November 2015, four soldiers were killed when a Black Hawk helicopter crashed during a training exercise. And in June 2007, a soldier who went missing for four days after a solo navigation exercise died from hyperthermia and dehydration while training in 90-degree heat. Thursday's accident came the same day the Navy said a pilot was killed when his Blue Angels fighter jet crashed near Nashville. Speaking in Singapore, U.S. Defense Secretary Ash Carter expressed condolences to the families of those killed in both accidents and said once investigations are complete, the military will take actions designed to prevent such incidents in the future. Also Thursday, the pilot of a U.S. Air Force Thunderbird ejected safely into a Colorado field, crashing the fighter jet moments after flying over a crowd watching President Barack Obama's commencement address for Air Force cadets. Across Texas, many were watching a new batch of storms that could dump up to 10 inches of rain from Thursday through Saturday and worsen flooding caused by waterways that already have risen to record levels. The heaviest rainfall Thursday night was reported in LaPorte, on the western shore of Galveston Bay, where 4.36 inches of rain was recorded between 5 p.m. and 8 p.m. Thursday. Earlier, a storm system that moved through the Houston area Wednesday night and Thursday morning dumped nearly 8 inches of rain in some of the city's northern suburbs, causing flooding in some neighborhoods. In Fort Bend County, southwest of Houston, about 1,400 homes have been affected by the Brazos River, swollen by heavy rainfall from last week. Officials say levels in the Brazos have not dropped much and additional rainfall could make the flooding worse. "With the rain that's predicted, that's not going to help things as that water has no place to go," said Lt. Lowell Neinast, with the police department in Richmond, where more than 700 people have been evacuated. Fort Bend County emergency management coordinator Jeff Braun said officials have worked to warn and prepare residents ahead of the additional rainfall. More than 50 people are staying at shelters in Fort Bend County, one of the 31 counties included in a disaster declaration by Abbott. Braun said it could be at least a week before the flooding recedes and residents can go home. This week's storms are the latest in a string of torrential rains since May 2015 that have put swaths of the state underwater. Some areas now overwhelmed by water had run dry two years ago due to drought conditions. "Our thoughts and prayers go out to the soldiers, their families and the Fort Hood community, and continue to be with those still unaccounted for. Texas stands ready to provide any assistance to Fort Hood as they deal with this tragedy. The brave men and women stationed at Fort Hood and across our country put their lives on the line every day, and be it through rescue operations or on the battlefield, Texas will forever remain grateful for their sacrifices."